There are 52 species of Watsonia. They are nearly all from Southern Africa, and are very showy Gladioli-like plants, first noticed by British naturalists in the 18th Century. The genus is named after the London Botanist Sir William Watson. All Watsonias are perennials, forming clumps of corms with sword shaped leaves and spikey showy flowers, most in mid to late summer. Most flower in shades of pink or red, with some cultivated white forms. Summer growing plants, from the summer rainfall areas of the north and eastern parts of South Africa. This is a smaller group of summer growing Watsonias. 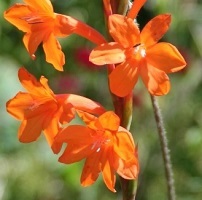 it includes Watsonia lepida from the Drakensberg Mountains and is hardy and well suited to the UK climate. These plants grow during the summer. Corms can be left in the ground over winter, or lifted after flowering and replanted in spring. By division: New plants can be created by removing the offsets from mature corms during the dormant period. By seed: Seeds should be sown in deep trays of well drained seed compost at 3mm deep. Winter growing species are best germinated at 10-20°C, most commonly in the autumn, and summer growing species at 15-25°C, most commonly in the spring. 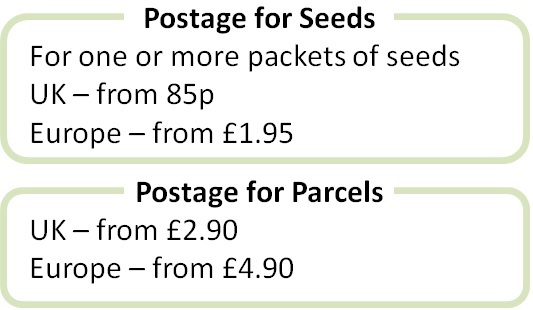 Germination typically takes 3-4 weeks, sometimes a bit longer. Seedlings should be grown on until the second season to allow a corm to develop, and then planted out. Flowering starts in the second season with most species in ideal conditions, sometimes in the third season. Watsonias grow best in sun and well drained soil. Flowering reduces if the corms get overcrowded, so it is best to divide mature clumps every 2-3 years. Watsonias respond well to a slow release fertilizer. They are not generally troubled by any particular pests or diseases. Some professional growers spray with an insecticide to prevent aphid attack and with a fungicide if the weather is warm and wet.